vulnerability for older adults, especially as they transition back to the community. implementation and dissemination across a health system. There is abundant evidence that an ED visit signifies a period of vulnerability for older adults, and the transition between the ED and community care can be fraught with challenges. 1–4 In particular, providing information to patients who are acutely ill or injured and their families is difficult in a busy ED. Many older adults have cognitive, vision, or hearing impairments and/or low health literacy, making it even more difficult to receive, process, and retain sometimes complicated discharge instructions. 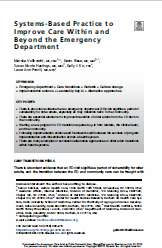 Patients with preexisting chronic illnesses, suboptimal medication therapy, and poor understanding of ED discharge information are at higher risk of return visits, underscoring the need to improve ED care transitions.5–7 This article describes some challenges of care transitions, reviews best practice strategies, provides an example of systems-based improvements at a health care system in Wisconsin, and outlines some lessons learned.